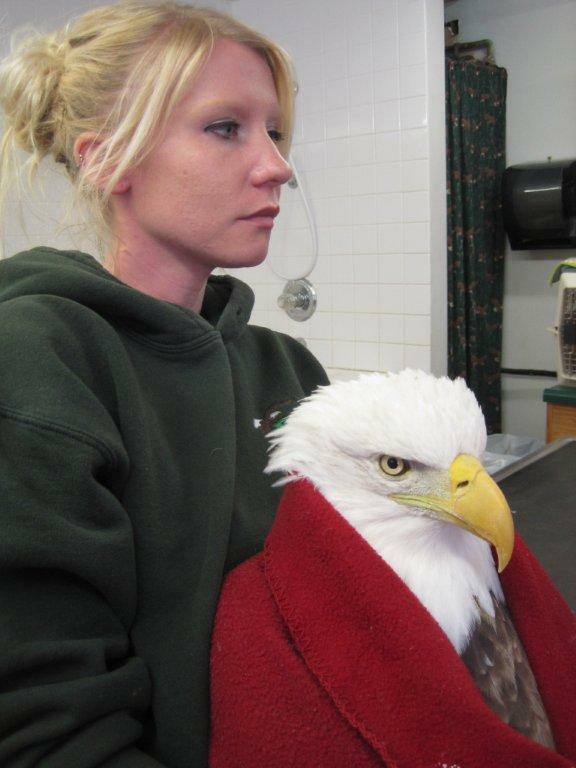 The female eagle has a beautiful story as many of our patients do. She was captured on a beaver dam after dark by two caring gentlemen. The men ended up in the water in the recover process in below zero temperatures. We don't suggest that kind of heroism, but when it occurs and everyone is OK, we are grateful. It turns out the female eagle is one of the local eagles that has lived on the family farm for many years. One of the men involved has since moved to another city for a career, but was home visting when they spotted the eagle not flying and acting oddly on the beaver dam. 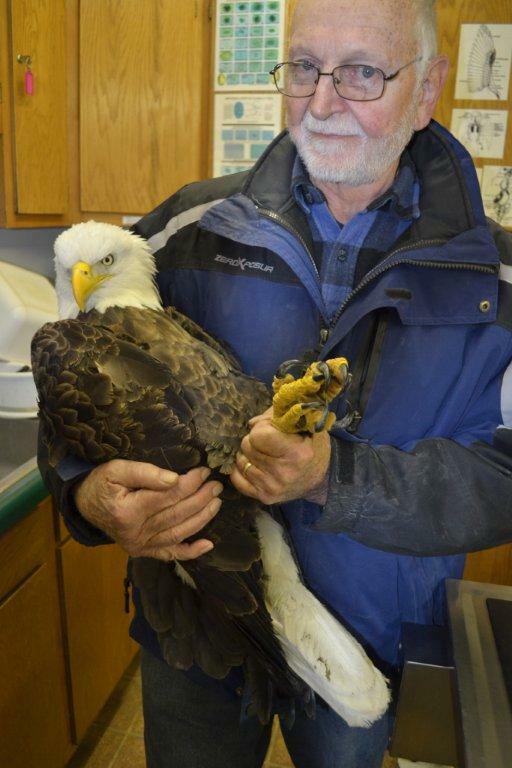 As I worked on the eagle in the clinic, he recounted beautiful stories of the times he watched this same eagle with this grandfather through the years. Now to have her in his arms was a sad turn. We hope we can get her back home again to breed once again on her territory and the land her rescuer grew up on. I draw blood on the female #005 when she is admitted while Don holds her. Neither of the eagles just admitted will have an easy recovery. While found in different areas of the state, their cases are so oddly identical from a clinically perspective, I can talk about them almost as one. Both eagles have neurologic symptoms. That means they still have siezures and other difficult symptoms. When that happens I stay with them often holding them during siezures so they don't injure themselves. Sedating birds is not a good option as they have small but efficent lungs. When sedated, their breathing is shallow and the chance for pneumonia is great. Since that is NOT what we want, we pull out all the stops to make sure they are safe even when it means I am up all night with them. That is not unusal as a matter of fact and will be the norm for the next few days at least. The female shows neurological symptoms and is disoriented. 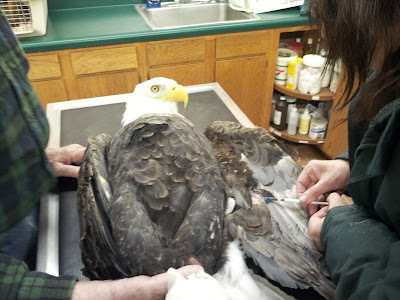 People often ask how we can do this work as it is gut wrenching watching these magnificent eagles endure the wrath of lead poisoning. I am not ever sure how to answer because there is no good option. Lead poisoning is human caused. I firmly feel it is a human responsibilty to help them in everyway we can. Our great joy comes the day they leave our arms as they are released to the wild. There will be many long days and nights and months of rehabilaition including reconditioning on the other side of this critical care time, but it is the reality of what lead poisoning is. Until we do something about it... the birds suffer and we help them recover if possible. The male Bald Eagle came from Park Falls, WI. The sad thing about his case is he was one of three eagles eating from the same carcass when they were found. He was the only eagle that was able to be captured. That means two more are out there from the same feeding area that are likely dying as I write this blog. Wisconsin has many remote areas in our northland. This eagle is from one of those places where few people will come across eagles in trouble. I have calls out to volunteers in that area. With a new snow fall tonight it is possible they will be able to use snowmobiles to do a better search of the area and hopefully find them soon. 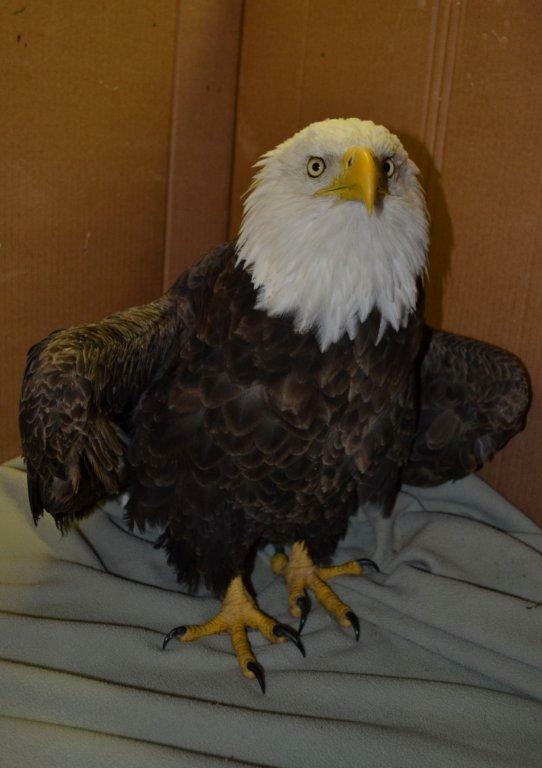 We also have a report of an eagle down near Medford, WI. The DNR was unable to locate it tonight before dark. If anyone that is reading this blog knows of its location pleaes give us a call. Don't worry I am not choking him :)) #007 is given a tube feeding of liquid food as his digestive system as well as other organs are failing.. The male eagle #007﻿﻿﻿﻿ weighs a little over 6 lbs. He should weigh 9-10 lbs. ﻿﻿ Lead poisoned bird are usually present with starvation as their digestive system shuts down due to the lead toxicity. It is 3:15 in the morning and I have one more check of the eagles before I sleep. 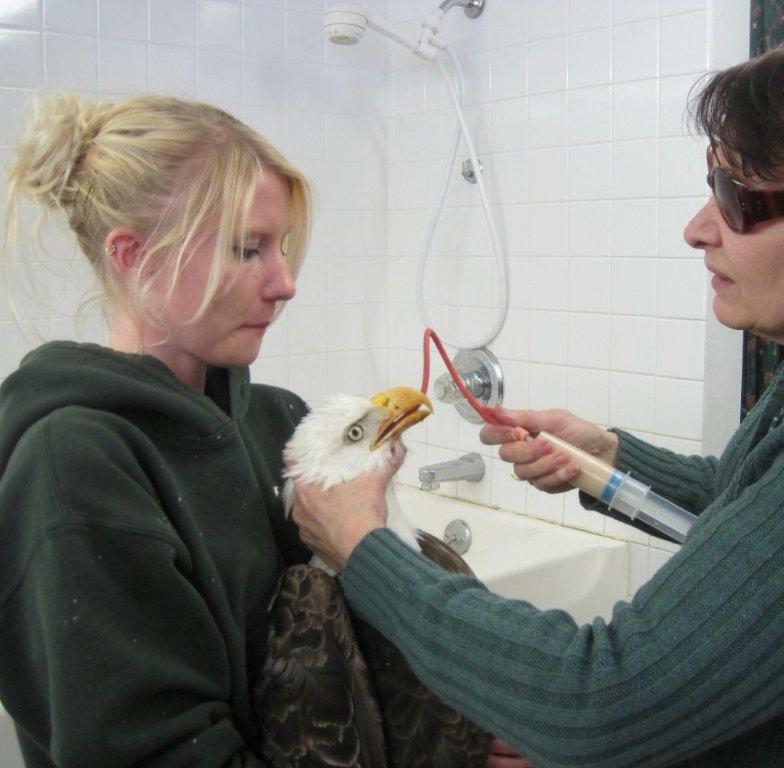 Please keep our eagles in your thoughts as they struggle with this horror that is lead poisoning. Prayers for you, Marge, as well as your team. I think you do great work. I am just sickened by this story. Unfortunately, I am hearing more and more stories such as this one. There is no question that lead ammunition and fishing tackle should be replaced by an alternative such as bismuth, steel or copper. My hope is that these magnificent creatures do not become endangered again, as they are our national symbol and deserve special respect and a safe and healthy environment to live in. I appreciate all that you are doing for this eagle and others who are victims of lead poisoning. It is so horrific. Bi-weekly I am on twitter trying to make people realize that all they have to do is to remove their kill or buy unleaded ammo. So many are fighting for this and far more than I ever could. Thank you again for all you do. Praying this eagle will make it. Please end needless suffering and work towards legislation to end the sale of lead based ammo! There are so many other alternatives out there and we love our national symbol and all wildlife!